WEST LAFAYETTE, Ind. — Civics lessons have never been as much fun as they are in “We the People,” a new musical revue by Theatreworks USA that will be at Purdue University’s Loeb Playhouse at 3 p.m. Feb. 19. This performance is presented by Purdue Convocations and includes a preshow activity. “Make Your Voice Heard!” will give participants a chance to learn more about the U.S. Constitution and how to be a good citizen. The event, sponsored by Purdue’s James F. Ackerman Center for Democratic Citizenship, will be at 2 p.m. Feb. 19 in the Stewart Center West Lobby. 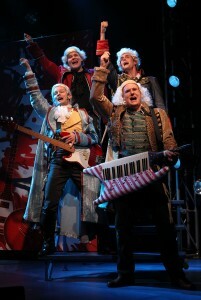 “We the People” is a rock musical revue that makes civics and social studies topics fun and accessible. Dawn Shapiro is a typical modern student who receives an inspiring visit from the original boy band, The Founding Fathers: George Washington, Benjamin Franklin, John Adams and Thomas Jefferson. Picking up where television’s “Schoolhouse Rock” left off, Dawn (and the audience) will learn about American government and leave inspired to get involved and ready to make a difference. “We the People” is directed by Gordon Greenberg (“Happy Days: The Musical,” and Theatreworks USA’s “The Mystery of King Tut”) with choreography by Michele Lynch (“The Coast of Utopia” on Broadway). Contributing songwriters include some of the brightest up-and-coming musical theater writers in New York, including Brad Alexander and Kevin Del Aguila; Eli Bolin and Sam Forman; Joe Iconis; Tommy Newman; Ryan Scott Oliver; Adam Overett; Jordan Allen-Dutton and Erik Weiner (“Robot Chicken” and “Boardwalk Empire”); and Mark Weiner. The book for the show was written by Joe Iconis (“The Plant That Ate Dirty Socks”). The production team includes Adam Koch’s scenic design and costumes by Lora LaVon (“Junie B. Jones”). This 60-minute musical is recommended for ages 9 and up. Tickets are $14 for the general public and $10 for children 18 years and younger, Purdue students and Ivy Tech Lafayette students. Tickets are available at the Elliott Hall and Stewart Center box offices at 765-494-3933 or 800-914-SHOW. Tickets also are available through Ticketmaster outlets. Discounted tickets for groups of 10 or more can be ordered at 765-496-1977.